"Awful lot of weather we've been having here lately." Alvin's grandparents immigrated to the USA from Bogatá, Columbia. Even though he is second-generation American, Alvin is fluent in Spanish and has a slight Spanish accent. He's a small, lean man, at times either feisty or self-deprecating, as the mood strikes him. He's shy around women, who typically describe him as “cute and funny”. Alvin is socially awkward, a bit naïve, and speaks with a lisp. 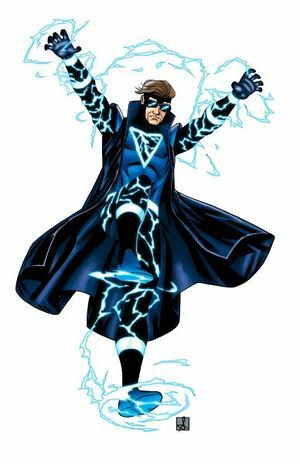 He's filled with self-doubt about his role as Aspect of the Storm, partly because he's never been good at anything in his whole life, and partly because he doesn't really understand his own powers. He can be temperamental and unwilling to cooperate with people if he thinks they are ignoring him or are condescending. Responsibility: The character is burdened by the responsibility of their powers. Alvin Craney was a clerk at the Phoenix Airport weather monitoring station when Paragon killed Thunderbird. When Thunderbird died, an enormous storm-eagle appeared in the sky and Thunderbird's powers were passed to Alvin. Alvin was raised in Phoenix by Carmen, his grandmother. He lives alone in a small apartment with his cat, Mr. Salad. Carmen watches Mr. Salad when Alvin is away. As Aspect of the Storm, Alvin has direct control over the atmosphere over an enormous area. He can control the winds, make it rain or snow, summon lightning, and make the air hot or cold. This page was last modified on 5 December 2014, at 10:04.